Answering an Old Question with Speech Act Theory. How can preaching be the Word of God if it comes from the words of a human preacher? Sam Chan answers this question with a survey of Luther's and Calvin's views on preaching. Then he gives a detailed biblical theology of preaching. 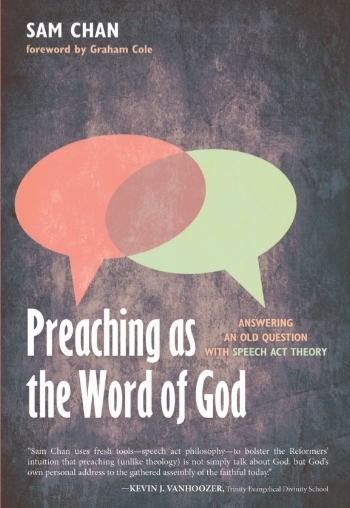 Finally, he applies speech-act theory to the theology of preaching. This may be the most comprehensive book on the theology of preaching - with a synthesis of historical, biblical, and philosophical theology. Don Carson: "The work is important not only for students of the Reformation, but for preachers who need to see that the faithful proclamation of the gospel is precisely what authorizes them to insist that their preaching is the word of God." Kevin J. Vanhoozer: "Sam Chan uses fresh tools--speech act philosophy--to bolster the Reformers' intuition that preaching (unlike theology) is not simply talk about God, but God's own personal address to the gathered assembly of the faithful today." Phil Campbell: "If you've ever heard him in person, you'll know Sam Chan is a preacher's preacher. He's vibrant, dynamic, funny, moving, and--when it comes to the text of scripture--deeply insightful. This book offers an intriguing opportunity to take a look 'under the hood' and see what makes Sam's preaching so potent. It's the work of a scholar who has thought deeply not only about how the Bible works, but how our own words work." Abraham Kuruvilla: "Chan explores some new ground in the interface between Speech Act Theory and preaching. Chan's lucid exposition is worthwhile reading for all interested in the hermeneutics of homiletics."